Butterflies and bumblebees, as well as native bees do a wonderful job of pollinating flowers. This is very important work, as it helps the flowers to set seeds which grow the next crop of that plant. This bumblebee is buzzing happily on a chive flower. It’s a more detailed drawing, taken from a photograph by Butterfly Woman Publishing. 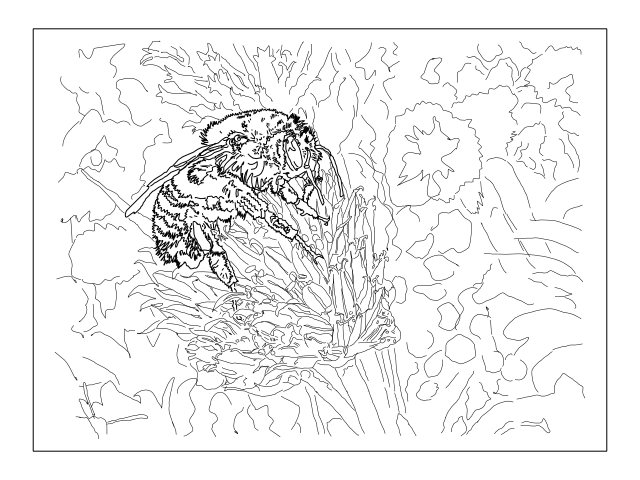 There is a larger size image on the “Colouring with Anasera” page, and there is info about the plight of the pollinators if you would like to zip over and visit. Here is a smaller image of the bumblebee picture. Me too. And yes they do! We have a lot of bumblebees here, and I used to think that they came out like big bustling mamas to help out the rather thin-looking overworked honey bees! I love looking at bees in pictures and on flowers. They do a great job of pollinating! Yeah – you go dude! Connecting with the inner pre-schooler… I like it! Imagine, rainbow striped bumblebees… wonder what they would sound like… cross between a honey bee and thunderclouds!